FreeFileSync was added by Aerialsky in Aug 2009 and the latest update was made in Mar 2019. The list of alternatives was updated Apr 2019 There is a history of all activites on FreeFileSync in our Activity Log. It's possible to update the information on FreeFileSync or report it as discontinued, duplicated or spam. Alternatives to FreeFileSync for Windows, Mac, Linux, Android, Android Tablet and more. Filter by license to discover only free or Open Source alternatives. 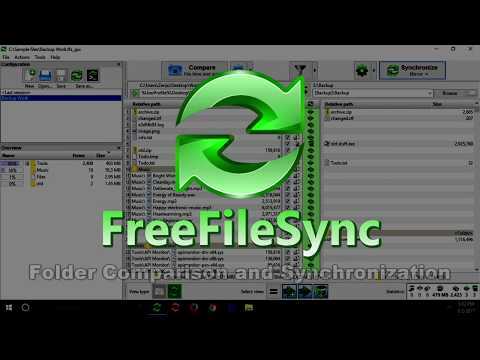 This list contains a total of 25+ apps similar to FreeFileSync. Good news: version 10.0, released on April 27 2018, no longer includes ads in the installer. Previous versions used to bundle optional software that was checked by default. Good news: as of v10.0 FreeFileSync is ad-free! Very good tool, but shame about the (optional) OpenCandy in the installer. You can donate to get an installer without OpenCandy adware. Unfortunately, you have to donate for every update then, but you can choose the amount yourself. Tip to avoid malware like OpenCandy and unwanted toolbars: install Unchecky. Does pretty much everything I need to do better than MS Synctoy. I had started off with that hearing good things until I found out it won't copy files that are in use. I'm using it to sync my XBMC database from my media center to my regular PC. It works like a charm. I also use it to keep my music synced across 2 computers (I like having it in both places) as well as my Portable Apps. It reads the changes ridiculously quick, copies files in use, and the interface stays relatively responsive. If you're looking for the portable version, look in the v3.2 folder. That's where it paf package was. There is no portable install anymore, and it is officially ad-driven, according to their website. I'd like to delete this comment, but there is no such option. Installed 7.3 and got no screen to opt-out nagware (which I was expecting), but seemingly no nagware as well. Either it was because I chose "portable installation", either they removed it. However, marking that positive, for now. While installing the same version on another win8.1 machine, I was given an option to opt-out, presented on dedicated screen. FreeFileSync is a great program, it fits my needs perfectly. I especially like the nice tree view, that shows what is going to be transferred, including size information. This is way better than the flat view most alternatives offer. So if your privacy is important to you, then use some other program, or at least block FreeFileSync and it's installer in your firewall (which of course is not an option, if you want to sync over the internet). Summary: Great program by itself, but includes spy- and adware. Thanks for this very important comment! I've just wasted an hour removing the OpenCandy / Delta Search from my computer that has been installed by FreeFileSync Setup. I wouldn't expect that from what I used to consider a great program! If anyone decides to use FreeFileSync, he/she should make sure to disable "Delta search engine" during setup. Well, this open candy stuff (now it's "Softonic Websearch Toolbar") is an option actually. As with many othe freewares, be careful upon installing : many times, there's a little checkbox hidden somewhere that prevents this kind of PUP to be installed. While I do not support unrelated installation suggestions in the installer, especially when they are pre-selected by default, you probably missed how it works. The installer provides you the option to install additional software. If you do not select it, nothing is installed in addition to the main program. The FAQ also shows how you can install with a command without even receiving the prompt for optional software. It also states that you will receive an installer without it if you donate. While I hate that its in there, it’s one of the few ways to get a little bit of money for open source software; so we should not be too harsh or unfair. Especially since I do not see a good FOSS alternative to FreeFileSync.